Your metal roof might be out of sight on a daily basis for you, but don’t let it be out of mind. Ignoring what you might think is minor roof damage – or worse yet, undetected damage – can lead to major water intrusion issues down the road to not only to the roof itself, but also to the building’s insulation and structural components, as well as inventory, equipment and furnishings. 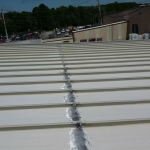 Although metal roofs wear extremely well, they have unique characteristics that, left unaddressed, can spread, worsen and lead to major damage. A major difference between a metal roof and a traditional flat, built-up, modified or single-ply roof is that metal roofs are designed for water flow, meaning there should never be any ponding or standing water on the roof for any period of time. While you might periodically take a look at your roof, it’s recommended to have a well-trained, experienced roofing technician perform a thorough inspection of your metal roof at least twice per year. 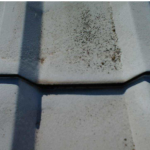 Being disciplined with inspections can result in early detection of the most common types of metal roof anomalies that lead to those pesky roof leaks. 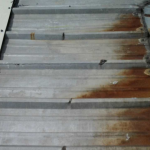 Surface Rust – Surface rust can become a major problem if left untreated. Rust is a reddish or yellowish-brown flaky coating that is formed on iron or steel by oxidation, especially in the presence of moisture. When rusting occurs, the oxides expand and occupy more space than the original material. Most metal roofing is made of galvanized metal or is coated to prevent rust from occurring, but ponding water or heat from direct sunlight can both wear the roof’s protection away over time. Monitoring for rust should be done at least as often as during semi-annual inspections; and a rust inhibitor, which forms a surface on panels, should be applied on any rust to stop it from forming in the future. Deflection – Crimped or bent panels can lead to ponding water on your metal roof, which can be a direct cause of leaks and rust. Oil canning – This is generally considered the perceived waviness in the flat areas of metal panels. Oil canning is an inherent characteristic of light-gauge, cold-formed metal products with broad, flat areas. Most of the time, oil canning does not present a hazard to the structural integrity of your metal roof. The best way to prevent oil canning on your metal roof is proper installation of high quality-metal material by a trusted and experienced roofing contractor. Movement – A metal roof should be designed to move, allowing for water to flow off of it. If a repair product is used that doesn’t allow for the proper elongation (or flexibility), the panels will continue to move but the patch will not, causing more issues than the original roof leak. Punctures – Punctures often occur due to heavy foot traffic on the roof, such as during construction, maintenance or HVAC equipment installation. For those who need access to the roof, specific walkways and guidelines should be in place to not crimp panels and to stay a safe distance from skylights. Also, equipment should never be dragged across a metal roof. Sharp objects falling onto your roof can also contribute to punctures. Caulking can be used to fix punctures but should only be considered a temporary fix. Incompatible metals – There are many types of metal roofs, such as copper, steel, stainless and galvanized metal. However, not all metals perform the same; and some are incompatible when used together. Specific materials should be used for metal roofs so that corrosion and rust do not occur. Dissimilar metals will cause a negative reaction when situated together, which can cause cracking, rust spots and prohibit water flow. Your metal roofing provider should be well-informed on metal compatibility issues to help you prevent problems from occurring. Fastener issues – There are two types of metal panel attachments – clips and fasteners with rubber washers. 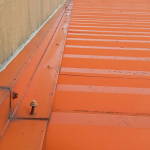 Clips fasten to the purlin, and the fasteners are concealed once the metal laps on the panels are seamed or crimped together with generally a sealant underneath. Fasteners with rubber washers are self-drilled approximately every two square feet. 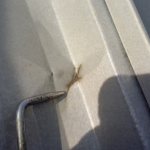 Over time, these fasteners back out and leave holes or gaps between the metal and the rubber washer where they were once installed, which opens the roof to water intrusion. If any of these anomalies is causing repeat roof leaks, it’s definitely time for a total metal roof replacement. Right? Wrong. 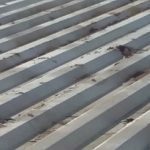 A roof restoration might actually be a more viable solution that would still bring the roof to watertight condition while deferring the immense cost and disruption of a replacement. As a national leader in innovative commercial roofing systems and service, Simon Roofing offers an accurate and reliable inspection of your metal roof through our scientific roofing evaluation called SR PreVision. 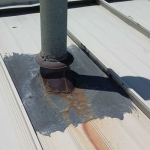 We take time to identify potential leak points and weak spots, so that we’re able to recommend the best course of action for metal roofs, whether that be repairs, restorations and, only if necessary, replacements. 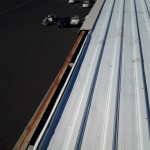 With a metal roof restoration, the focus is on extending the life of the roof you already have; not jumping into an expensive and possible unnecessary replacement just because a few recurring leaks or anomalies appear. In addition, Simon Roofing can develop a coating to match with your roof’s existing color, even if aged and weathered, to offer an attractive and consistent look from any angle. Check out a case study with Xavier University of Louisiana here! A metal roof restoration is not just patchwork, but rather a permanent re-roofing solution. Plus, with Simon Roofing, a restoration can be performed in stages over a multiple year period, allowing you budget flexibility. And after repairing and restoring individual sections of a roof as need be, the entire roof can be under a new warranty while you reset the clock on your roof’s useful life expectancy. Keep a roof restoration in mind as a practical option for bringing your metal roof back to watertight condition and back under warranty.